In the past several decades, the railroad presence in the downtown area of Lincoln, Nebraska, has been significantly diminished. This pictorial looks at the many changes that have taken place around the city's former Burlington and Amtrak station between the early 1960s and 2012. 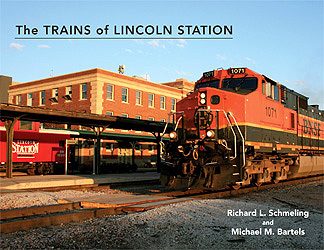 The authors, noted Lincoln area rail historians, recount the history of Lincoln’s “Burlington box,” various steam and football excursions that operated, and changes to local passenger train service during the Amtrak era. Photos by a number of local rail photographers show the equipment, area facilities and special events that supported depot operations. This is a visual document of how the trains of Lincoln Station were gradually replaced by what is now a vibrant retail and event district for Nebraska’s capital city.